With more than $1 billion to spend, the Ralph C. Wilson Jr. Foundation is less interested in funding show horses than work horses. DETROIT — The small glass entrance at 3101 East Grand Blvd., tucked on the side of a building next to a Goodyear Tire store, is an unlikely location for a billion-dollar foundation. The recently renovated building, vacant for decades, sits around the corner from a block marred by empty and neglected buildings. The Ralph C. Wilson, Jr. Foundation could have chosen to set up shop anywhere in southeast Michigan. Instead, it opened 11 months ago in a stretch of Midtown that also holds building blocks for the city's emerging comeback. A new streetcar has a nearby stop and the road has been repaved and striped. Shinola, a 6-year-old watch factory, is several blocks away, as are Wayne State University and the College for Creative Studies. "Part of the strategy was to help accelerate development on the northern side of town, and to signal to folks that we are serious about being part of this community," said Jim Boyle, the foundation's vice president of programs and communications. That approach offers a glimpse into a billion-dollar legacy left by Wilson that aims to be a catalyst for Southeast Michigan and Western New York. Both regions have had some success recovering from decades of economic and demographic decline — but have long ways to go. The Wilson Foundation, which began in 2015, is already — by a wide margin — the largest philanthropy operating in Western New York. It is among the largest in Southeast Michigan. Some $237.2 million has been spent or is in the pipeline for dozens of projects in both Rust Belt regions over the foundation's first three years and nine months. Southeast Michigan has garnered $121.2 million in grants, while Western New York received $115.9 million. An additional $12.7 million was spent outside the two regions, mostly in the first round of 2015 grants. More than $1.4 billion — and ultimately as much as $2 billion, depending on the stock market and other factors — is expected to be spent on the two regions. But for all the money that will be spent, Ralph Wilson left only one mandate for how that should be done: Finish in 20 years. "Ralph spent a lot of time thinking of this," said Jeff Littmann, his longtime treasurer and a Wilson Foundation trustee. "What Ralph said repeatedly is that I don't know what things will look like when I cross the goal line, or what they will look like 20 years from then. So, you guys figure it out." Already, the money is reshaping the shores of Detroit, bolstering youth education and recreational opportunities and supporting cultural organizations in Buffalo. 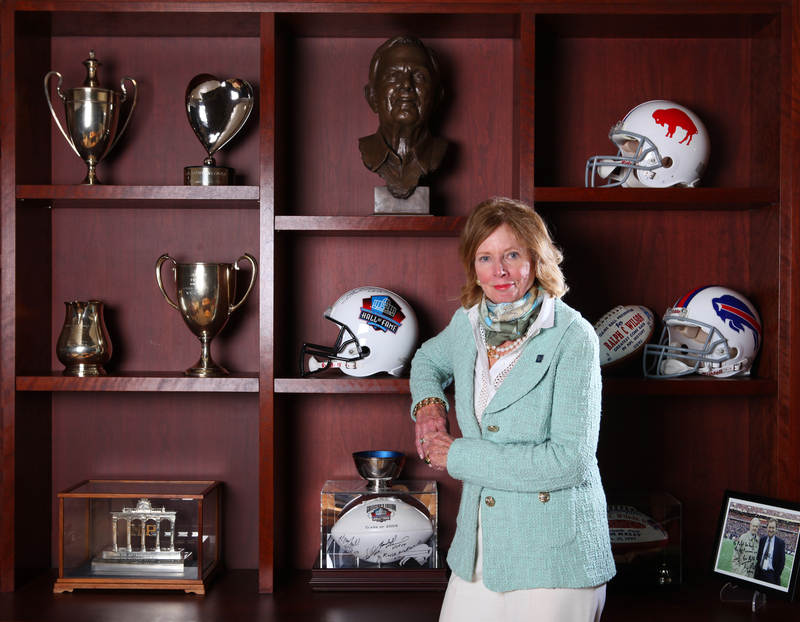 Ralph Cookerly Wilson Jr. made it known before he died in 2014, at age 95, that the sale of the Buffalo Bills and a portion of his estate would be used to create a philanthropic foundation. But the businessman, who made his first fortune in trucking and insurance, co-founded the American Football League and owned the Buffalo Bills for 54 years, left it to four hand-picked life trustees to decide the foundation's focus. Mary Wilson, one of the four trustees, said her husband never talked to her about specifics on how he wanted the money spent. "Ralph didn't want to talk about those things," Wilson said. "He wanted to put the right people in place, and wanted us to do the work. He wanted people who knew him best to carry out the way he lived his life." Along with Mary Wilson, he chose Littmann, his niece and former Bills Vice President Mary Owen, and Michigan attorney Eugene Driker to serve as the trustees. Wilson tipped his hat on only one concern — caregiving — that he wanted the foundation to address. Eventually, the four trustees, with the help of Rockefeller Philanthropy Advisors, developed the foundation's structure and vision based on Wilson's values and concerns. It was decided early on that the foundation would focus on Southeast Michigan, where Wilson was born and lived all his life, and Western New York, his adopted region. The trustees created four broad areas of focus: children and youth, young adults and working families, livable communities, and caregivers. The staff that was hired, led by president and CEO David O. Egner, who came on board in January 2016, began putting a premium on organizations, programs and projects that could advance the foundation's agenda. Projects in Southeast Michigan had a head start over Western New York, and provide clues for the kinds of programs that could find support in Western New York. The Downtown Boxing Gym is one of them. Inside the busy gym on a recent day, teens took turns jabbing boxing gloves into punching bags. Other children were in classrooms doing homework, with tutors and mentors at the ready. The after-school program, located in an underserved part of Detroit, helps 170 young people from ages 8 to 18, almost all African-Americans. While boxing lures kids in, administrators say, it's really an intensive academic intervention program. There are enrichment programs, too, including classes on computer coding, cooking, music, science, engineering and art. Since the facility opened its doors in 2007, the high school graduation rate for participants has been an astonishing 100 percent. Ninety-eight percent of the students have gone on to college. Some 850 children are on the waiting list. The Wilson Foundation gave the organization a two-tear, $500,000 grant, the largest pot of money the Downtown Boxing Gym has ever received in its 11-year history. Some of the funds are being used to pave the way for founder Kahli Sweeney's eventual successor. Research shows that when leaders leave the organization they founded, the organization often flounders. This is an issue the Wilson Foundation frequently wrestles with. Foundation leaders want to make sure its contributions are in projects or in partnerships that will be sustainable for decades to come, long after the foundation goes out of business. That has led the foundation to invest in nonprofit development, with scrupulous evaluations and follow-up. The Downtown Boxing Gym checks off several of the foundation's priorities — youth sports and recreation, healthy lifestyles and after-school care. 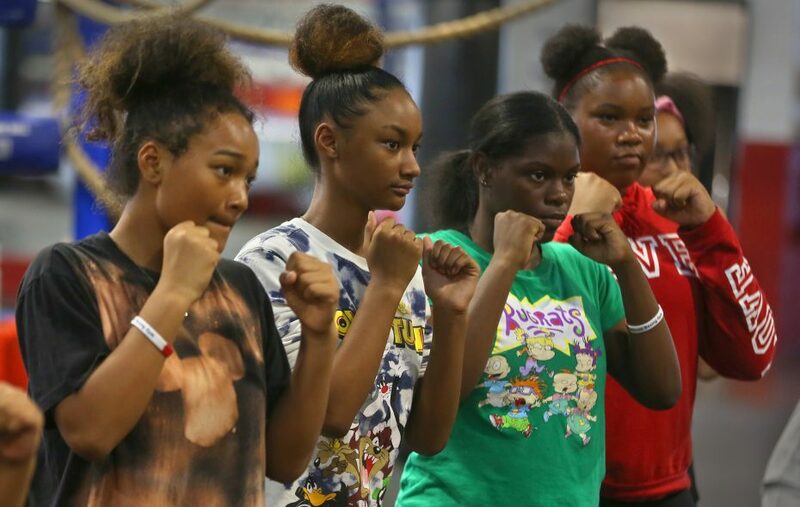 "Most of the kids will tell you they box and that they are boxers, because it is that cool thing you can say you are going to do," said Jessica Hauser, the executive director. "That was the beauty behind how Kahli designed the program, because nobody is going to make fun of you for going to a boxing gym." "He knew for himself when he was young that he would not have gone to a Detroit reading program, he just wouldn't. But a boxing gym? Yeah, he'd go to a boxing gym." Expectations are high, Hauser said. "We expect the exact same thing out of our kids as a kid going to an incredible college-prep private school," she said. "We all know the hurdles they are facing, but we don't put that out there as a reason why they're not doing well in school. "We make sure, to the best of our ability, that we are providing the tools and the support to help them work around that stuff. But when they come through these doors, they are expected to be amazing," she said. The foundation puts a premium on solid research and data to support programmatic goals. It commissioned a report on youth and play opportunities in Southeast Michigan and Western New York that Carolyn Geck, the gym's development director, said has been a big help to the program. "That data for us is really important because it helps us figure out how we best serve these kids," Geck said. Joanna Velazquez, a 10th-grader, said she hopes more kids can benefit from programs like theirs. "This is a better school than my actual school, especially with tutors who sit down with you and teach you step by step," Velazquez said. 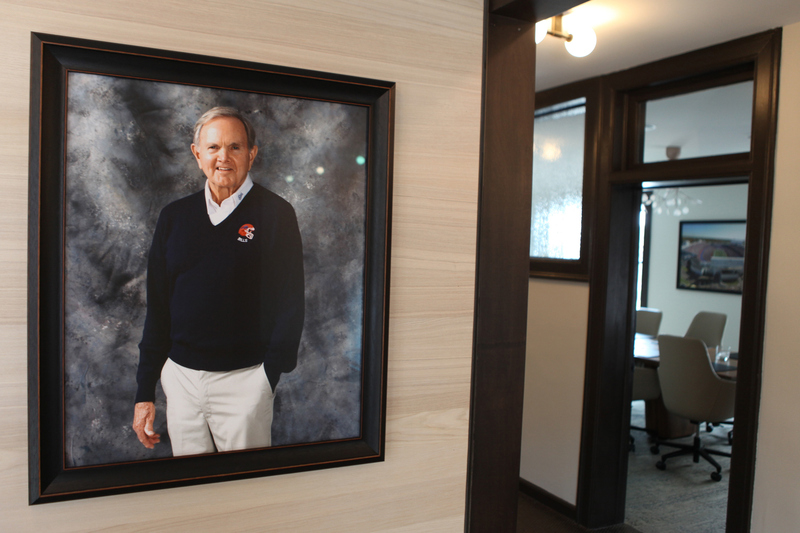 A photograph of Ralph Wilson with the seven other founding members of the American Football League, and its commissioner, hangs prominently in a comfortable space inside the Detroit headquarters of the Wilson Foundation. The group later dubbed themselves "The Foolish Club," since many thought they were foolish to attempt a rival league to the NFL. The $25,000 Wilson spent in 1960 would lead to the team's sale to Terry and Kim Pegula for $1.4 billion and the creation of the foundation. The photograph reminds staff of the importance of risk-taking and, in football parlance, reaching for the goal line. An abundance of open spaces and furniture supplied by Buffalo's Kittinger Furniture Co. encourages collaboration among the foundation's 20 staff members. 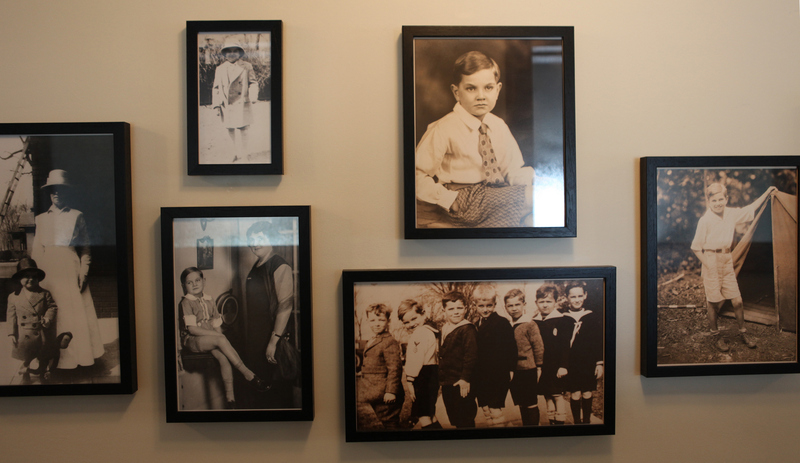 Walls are lined with photographs of Wilson. Most show his association with the Bills, along with images from his early life, naval service during World War II and Hall of Fame induction. "Our offices aren't plush," said Mary Wilson. 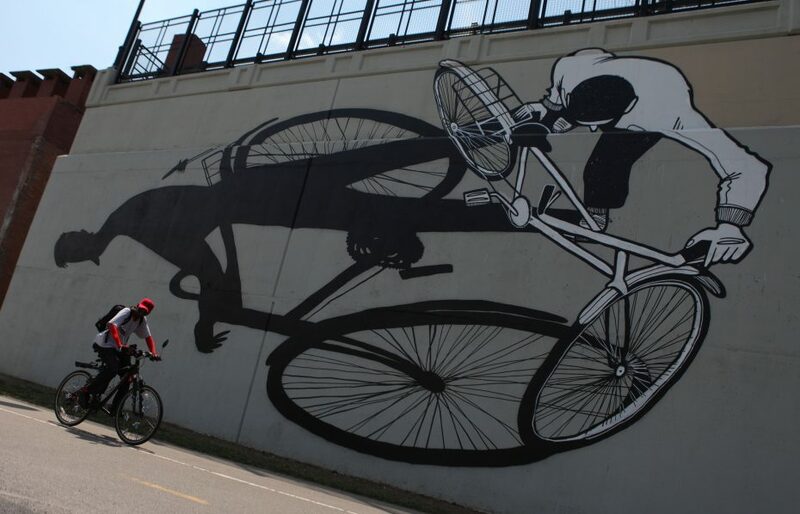 "We wanted to make a statement we're part of the resurgence of Detroit. He would not want us to go out and act like the big dog, telling people to do it our way." The foundation leases the space, but gave Midtown Detroit Inc., the owner, a $500,000 grant for green infrastructure for what it considers an anchor building and catalyst for the ongoing rebirth of Midtown. The building reflects the foundation's interest in environmentally sustainable design. There is a green roof, water capture system, high-efficiency mechanics and toilets that flush with rainwater. The first floor demonstrates the foundation's commitment to nonprofit support and innovation, as well as community collaboration and risk-taking. Construction on the first floor is making way for a 7,500-square-foot space that will bring nonprofits together with the goal of connecting them to resources, skills and the opportunity to learn from and cooperate with one another. The foundation is providing $5 million for the innovation center over the next few years, which will be operated by TechTown, a business incubator. The foundation may look in the future to do something similar in Western New York. "We are really carrying out Ralph's vision, even though he didn't put it on paper," Mary Wilson said, referring to the foundation's involvement in a myriad of projects. "It is what he would have wanted," she said. "Have we strayed? If we decided we needed to move to New York City and be a hotshot foundation, that would definitely have been the wrong direction." A review of the foundation's grants shows it is less interested in funding show horses than work horses. Programs that encourage entrepreneurship, economic development and help working families are high on the foundation's list. Inside the Michigan Technical Education Center, the whirring sound of robots in a fenced-in area can be heard as machines perform manufacturing tasks they were programmed to do. The foundation gave the job-training center, housed in Macomb Community College, $1.1 million to support certificate and degree-granting job training programs in advanced manufacturing. The grant will pay tuition costs of $4,000 to $14,000 for up to 150 students who attend six to 14 weeks of training. The program also offers transportation, resume-writing skills and other help. "The students have the advantage of being exposed to technology that they will see once they get the job and are out there," said Holger Ekanger, the program's director. Prospective employers, however, don't contribute much to keep the program going, and federal dollars have dried up. "The jobs are waiting for them," Ekanger said. "But without funding, the students wouldn't have the chance to go." Since 2010, over 1,000 employers have hired 5,000 students. About 94 percent of the students, roughly 38 percent people of color, complete the program, with about a 90 percent placement rate. "These are numbers that are unheard of," Ekanger said. Carmen Brown, a 39-year-old single mother with a smile as big as her ambition, said she was grateful for the chance to make a career change. "I'm totally a girly-girl, but I kept reading articles about grants and funding for women to go into manufacturing," Brown said. "I walked in the door, saw the robots and it was very intimidating for myself, but I thought, 'I'm going to get in there because I'm super-competitive.' "
In Buffalo, the foundation's commitment to job training includes $1.5 million for the Northland Workforce Training Center and $328,000 to Goodwill Industries of Western New York for advanced manufacturing training. Like parts of Buffalo's waterfront, the undeveloped western end of Detroit's riverfront looks like an empty canvas waiting to be drawn. A decade ago, the eastern end, along the Detroit River, also got little use because property owners restricted public access. Today, under the Detroit RiverFront Conservancy's stewardship, the 3-mile-long RiverWalk connects parks, plazas and pavilions, drawing an estimated 3 million people annually. The Wilson Foundation provided a grant for $345,000 to support a community-driven design competition to create a premier urban park on the western side. The 22 acres would feature a playground, pavilion and cove with a beach for water activities. As part of the process, an advisory team of 21 community members from diverse socioeconomic and racial backgrounds was assembled. The group, after being taken on trips to parks in Chicago, New York and Philadelphia, provided feedback that helped determine the goals of the design competition. A similar process is being funded by the foundation for reimagining LaSalle Park on Buffalo's West Side. A 2013 study conducted by the conservancy found the RiverWalk had improved quality of life by reconnecting with nature and alleviating stress. It also is spurring economic development on nearby streets. For the Wilson Foundation, it was an ideal project. It addresses several of its priorities — from parks and livable communities to working families and economic development. "The riverfront really tells everyone that they belong here, that they deserve a special place," said Mark Wallace, the conservancy's president and CEO. 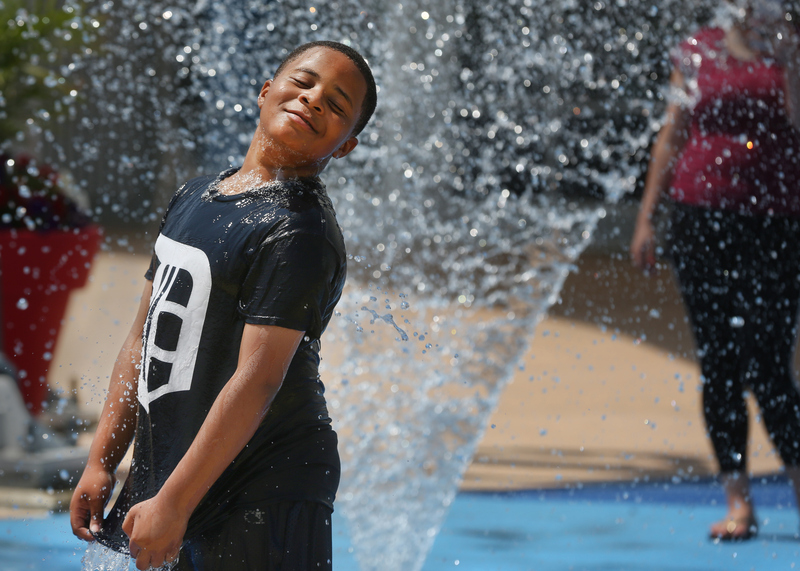 "It's a real sign of respect for the community that someone cares enough about you to build this, and to preserve and maintain it, at a level that the citizens of Detroit deserve. "If you're a kid growing up in a place where the sidewalk's not shoveled and the street's falling apart and there's a vacant house next door," he said, "being able to come to a place like this and just be relieved of all that stress is really important."